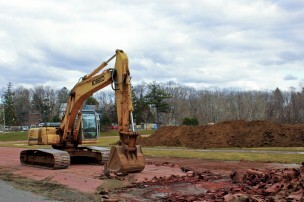 On March 11, the University began the outdoor track renovation and turf field installation project at Freeman Athletic Center. The outdoor track will be closed to the public throughout the completion of the project. Administrators expect the field to be complete and fully functioning by the beginning of the 2014 fall term. Former Director of Athletics John Biddiscombe initiated the plans for this project, which has been in the works for approximately five years. The plan was approved last year, and the University agreed to fund the track renovation, but the Department of Athletics remained responsible for funding the new turf field. According to Director of Athletics and Head Football Coach Mike Whalen, who, along with Assistant Athletics Director for Operations Erin Carey, was involved with the planning for the new track, the Department acquired the funding for the turf by contacting alumni, collecting donations, and hosting events, including a Boston event featuring Head Coach for the New England Patriots Bill Belichick ’75 as a guest speaker. Problems with the former track and field included limited space for lanes and an older surface, which can result in discomfort and injury for runners. The artificial turf field will be larger, allowing other teams to utilize the field. The University’s track team was unable to schedule any home meets this season, and practices are now being held on Middletown High School and Coginchaug High School’s tracks. According to track team member Leyna Donaldson ’15, this change has not proven overly stressful, and because most meets are just a few hours away, travel is not excessively difficult. The new turf field will be built first, during July, and the base of the track will be installed in the beginning of August. After the surface is placed, the track will have to cure for 30 to 40 days and then will be ready for the fall.